This week’s guest post comes to us from Jill Morningstar and Terence O’Neill, who work as librarians at Michigan State University. In it, they discuss Maker Day, a recent event. Read on for more! The inaugural MAET Maker Day at Michigan State University Libraries came together perfectly, and would not have been possible without the dedicated students and faculty in the hybrid MAET program. The Master of Arts in Educational Technology program enrolls current K-12 teachers who want to expand their knowledge in the realm of educational technology. Many students become Technology Integration Specialists, Instructional Designers, and Technology Consultants in their schools. The program takes about two years to complete and is mostly online. Students spend a little over two weeks on campus at Michigan State University for intensive face-to-face training over the summer, and one of the major assignments for first year cohorts is to create a maker activity to integrate into their classrooms. Led by Dr. Leigh Graves Wolf and Dr. Michelle Schira Hagerman, the MAET 1 cohort spent their two weeks of face-to-face time meeting with librarians and planning their maker activities. With the help of instructors Craig McMichael, who teaches at Detroit Catholic Central and is a current faculty member at both MSU and Wayne State University, and Spencer Greenhalgh, PhD candidate at MSU in Educational Psychology and Educational Technology (EPET), along with a few of our librarian colleagues, MAET students spent one hour of each packed day planning their activities at the library. They were able to spend time working in our brand new REAL (Rooms for Engaged and Active Learning) classroom and they even had a personal showing of the library’s Makerbot before we had unveiled it to the public. The students were inspired by their time spent in the library, and of course their instructors and each other, which led to the amazing turnout on Maker Day. On the day of the event, the library simply set the stage and allowed for the MAET students to run their workshops, trying out their ideas with real live audiences from a variety of age groups. As a great example of the low startup needs for running Maker activities, we set up the workshops in a variety of library rooms with little rearrangement needed. “Human Drum Kit”: using MaKey MaKey, Scratch, and a computer’s sound system, MAET students designed a program where participants united circuits to signify different parts of a drum kit. Touch that person’s shoulder for a cymbal, this one’s knee for a bass drum, and *gently* tap your new friend’s bald head for a cowbell. 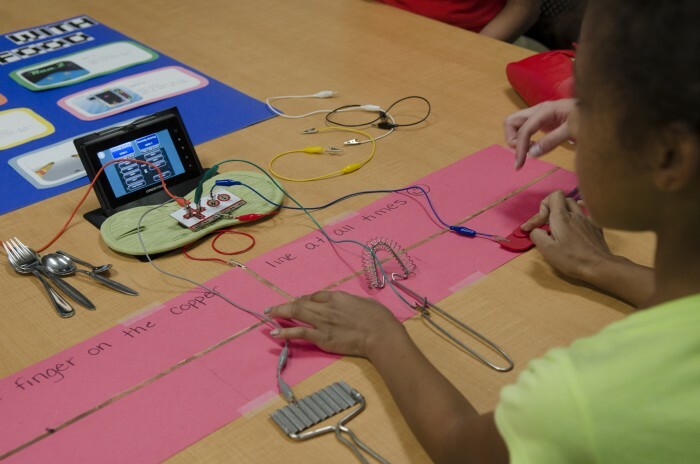 “Playing With Your Food”: This group used MaKey MaKey and Scratch to enable the creation and manipulation of video games based on the completion of circuits using items from the kitchen. “And a third tied together geography and cultural studies, creating an interactive map that lit up LED lights for the home of each participant. The workshops were a huge success, as the MAET students got practice running workshops, the library got to experiment with different types of Maker workshops, and participants got to have some fun and learn a bit, too. As our library continues to think about how to engage with and support our community as they pursue their scholarship and teaching, we hope that collaborating with the Master of Arts in Education Technology will continue to reveal what’s happening on the cutting edge. To learn more about the Master of Arts in Education Technology, visit their website here: http://edutech.msu.edu/programs/masters/. And if you’re in the area, feel free to visit MSU’s library and see how we’re using 3D Printing and our Espresso Book Machine to enable our students and professors to create the next generation of education deliverables.